DiiA members will be able to use the DALI-2 logo on their certified products, signifying improved interoperability and enhanced functionality. The Digital Illumination Interface Alliance (DiiA) has acquired the trademarks relating to DALI lighting products and systems via ISTO. These trademarks include the original DALI logo, the new DALI-2 logo, and the DALI wordmark for use in lighting applications. 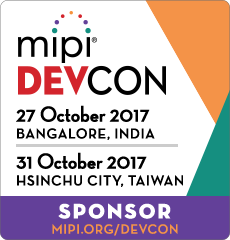 Join us at MIPI DevCon 2017 that is open to all MIPI Members, industry representatives, press and analysts. The focus of the conference will be to provide developers and implementers of MIPI Specifications a forum for training, education, and networking. MIPI Alliance Working Group Chairs and other MIPI experts will lead the sessions providing implementation experiences, use cases, and application examples from a technical perspective. In addition, MIPI Alliance Members will provide product demonstrations at the venue. For more information, visit the MIPI DevCon website. This statement aims to foster global development of indoor public space venue maps as Open Data to unleash the opportunities for indoor Location-Based Services (i-LBS). The signers of this statement recommend that i-LBS be based on indoor maps that are readily accessible via agreed upon open standards and are made available as open data where possible. Indoor venue maps as the basis for i-LBS will benefit multiple societal sectors with particular benefit for indoor emergency response. Accurate localization positioning technologies are now available for i-LBS. Indoor location systems, when complementing traditional outdoor location positioning solutions, can enable new sophisticated services based on real-time tracking of people or assets. This document defines guidelines for signing SWID tags in support of the [SWID] standard. The standard states that when digitally signing SWID tags, implementors will follow at a minimum the [XMLDSIG] recommendations, use an enveloped signature, add a timestamp per [W3C-XAdES], and include the public signature for the signing entity. This document details and builds on those requirements. The guidance drafted herein supports the security and reliability of tag signing. These guidelines are drafted with the needs of implementors in mind and to provide value for all members of the software eco-system (publishers, tools and service providers, and end-users). The MIPI® Alliance, an international organization that develops interface specifications for mobile and mobile-influenced industries, recently announced the formation of a Security Birds of a Feather (BoF) group to evaluate potential needs and strategies for addressing security in MIPI Alliance interface specifications. The Alliance is issuing a call for participation in the BoF to engage the broadest possible community of security representatives in this work. The group is open to MIPI Alliance member companies as well as non-member security experts. LED modules and light engines for spotlighting applications are the focus of a series of new and updated specifications from the Zhaga Consortium. The Zhaga Consortium, a global association of lighting companies that is standardizing components of LED luminaires, has finalized several new and updated specifications for LED lighting products that are typically used in spotlighting and related applications. The three specifications – designated Books 10, 12 and 17 – all describe LED light sources that have a small, circular light-emitting surface (LES) of less than 30 mm in diameter. Several of the specified product types have already been widely adopted in the lighting market. Safety needs vigilance. All products that transfer electrical power inherently have the potential to do harm, and manufacturers must take care to use suitable components and implement safety precautions. Cheap traditional mobile phone chargers that connect with the phone via a USB or Lightning connector are sometimes made with poor quality components that fail to meet safety regulations to cut costs. This means they can cause injury, electric shocks and even fires. 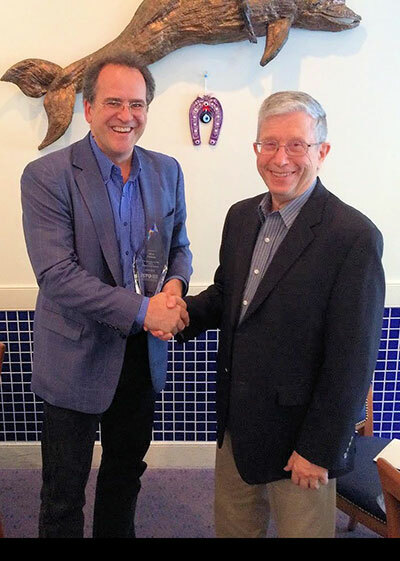 Roger Martin (right), ISTO Board Secretary, recently presented Mike Violette (left) with a service award for his time as an ISTO director. Presenting on behalf of the ISTO Board of Directors, Roger met Mike for lunch in May 2017 and handed over an award for service to the ISTO Federation. 14 April 2017 - What Does the MIPI Alliance Have to Do With Cars?